This article is in need of additional images. If you have a good image for this article, upload it here. Artwork of a Topi from Ice Climber. Topi (トッピー, Toppi) is a common enemy from the Ice Climber universe. Topis appeared as enemies in Ice Climber. They would appear from either side of the stage and will try to prevent the Ice Climbers from scaling the mountain by pushing blocks of ice into the holes the duo created on the stage; furthermore, they could send the Ice Climbers falling down the stage if they ran into them. They could be defeated, but would respawn after some time. Topis had different appearances between the Japanese release of Ice Climber and the international release. In the international releases, Topis are small bipedal creatures that resemble small yetis and their whole body is covered in white fur. They have small legs and small arms that help them move around, with their mouths somewhat resembling beaks. In Japan, Topis insead appeared as blue seals; the change in appearance is assumed to be due to the controversy surrounding seal clubbing in the Western world. 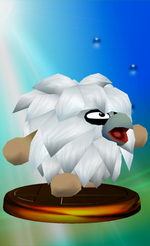 The yeti Topi in Ice Climber. The seal Topi in Ice Climber. 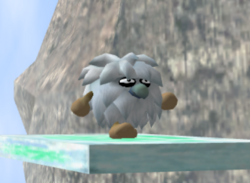 Topi made their debut in Super Smash Bros. Melee, acting as enemies in Stage 10: Icicle Mountain in the game's Adventure Mode. Any character who makes contact with them will take damage and knockback. Topis also have the ability to slide across platforms, making them move at a faster pace. On Icicle Mountain, they are often spotted with Freezies, despite the item not coming from the Ice Climber universe. Characters are awarded 200 points for every Topi they KO. Of note is that blocks of ice Topis pushed in Ice Climber are used for the Ice Climbers' Ice Shot. Announced at E3 2001, they also can come out of container items in other modes. Like Ice Climber itself, Topis have differing appearances between the Japanese release of Melee and its later, international releases. In the original Japanese release, they resemble the blue seals of the Japanese version of Ice Climber, but they are instead the white, yeti-like creatures in international versions. The two versions function identically, and uniquely, the blue seals do not appear in the North American version even when the language is set to Japanese. The change was presumably due to controversy over seal hunting, though it is also possible that the change was merely to preserve the continuity of the Topis' appearances between regions. Topi trophy using its model from the Japanese version. The Japanese version of the Topis in Adventure Mode. The Topi trophy in Melee. Topis debuted in the game Ice Climber, shuttling ice with which to repair in the floor. They were kept really busy, as Nana and Popo constantly cracked floors with single strikes of their ice hammers. Despite the monotony of their chilly work, these creatures never slacked off for an instant. This page was last edited on January 19, 2019, at 20:04.